I love Sigma brushes! They are the only brushes I use on my face, and they last forever. I think I have every product from the Sigma website, some I even have doubles. However I don't have the Buffer F45 brush in my collection, until now! Usually I would use a brush like this for mineral makeup, (which I don't use) so I was wondering how I would use this cute little makeup brush. The Buffer brush works great with powders and foundation setting. I like to use this with after my daily makeup regimen with my MAC blotting powder. Works great. The bristles aren't scratchy or stiff, which shows you the high quality that Sigma delivers with each of their brushes. The Sigma Buffer brush sells for $19, and it's worth every penny. The first time I used the brush a couple of the bristles fell out, but this is easily one of my favorites in my collection. Sigma brushes really do last a long long time, I haven't had to throw any out yet and I've been using them for well over 3 or 4 years. I just make sure I clean them at least once a week, and they are back to brand new. 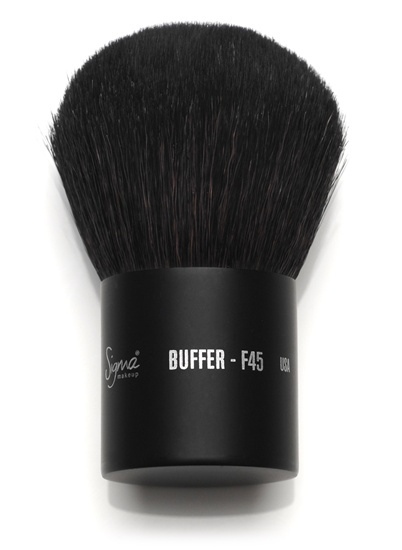 Buy: You can purchase the Sigma Buffer F45 brush at Sigma's website. Right now use coupon code GLOW2011 at checkout for 10% off your order. Also use coupon code TEEN2011 10% off any Sigma order plus FREE premium gift when you click coupon. $10 off Face and Eyes Kit + Heart Shaped Mirror in Some Like it Hot! The Giveaway: One winner will win a Buffer F45 brush!! ($19 value!) We are going to keep this one really simple.. simply fill out the Google Spreadsheet telling me your favorite product from Sigma, and you're entered! If you would like an additional entry, simply follow me on Google Friends, or for a third entry like me on Facebook. Giveaway ends 9/12/2011. Open to the US only. Winner will be chosen by random.org and will have 48 hours to respond to the winning email. No Po Boxes please. Cheaters will be disqualified.